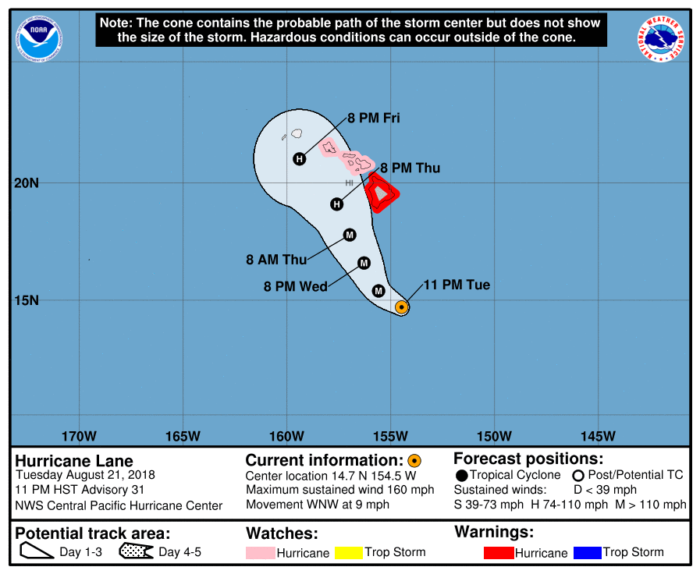 A Hurricane Warning is now in effect for Hawaii county as Hurricane Lane strengthened to a category 5 storm overnight. A Hurricane Watch remains in place for Maui county and Oahu. Lane is continuing to move to the west-northwest around 9 mph. The center of Lane is expected to move very near, or even over the Hawaiian islands from Thursday through Saturday. Lane’s maximum sustained winds are near 160 mph with higher gusts. Some weakening is anticipated over the next few days. The main threats with Hurricane Lane remain the same. Hawaii is expected to experience hurricane force winds and torrential rainfall. Anywhere from 10-20 inches of rain could fall which may result in flash flooding and landslides.